Tutorial: PogoAddiction Badges 101 - Where to start and what to do! Just can’t get enough of those pogo challenges, can you? Well, neither can we! PogoAddiction offers a plethora of extra-special challenges in your favorite games! Every Friday, two new weekly challenges appear on the PA Forum Badges page—find it by clicking on the PA Forum Badges Badges at the top of the forum. Mid-page, you’ll find this week’s challenges—are you up to the challenge?? 1. Play the Pogo game cited in the challenge. For this example, let’s use the Dice City Rollers "Club Suite Badge". 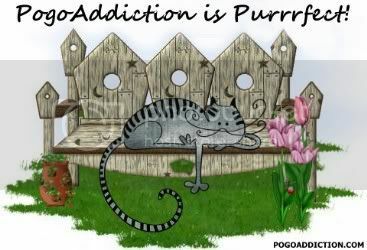 We need to win 50 or more auctions to get our PogoAddiction Badge for this. 2. Now before you wade into the wide world of pogo real estate, locate your Print- Screen-SysRq button, in the upper right-hand corner of your keyboard. This button will essentially take a picture of whatever is on your screen. Open your preferred graphics program (on windows systems, this would be MSPaint by default, but it can be whatever one you prefer to use—make a shortcut button for it on your desktop, if you haven’t already). 3. Bring up your current stats, making sure you have the required number of auctions won (whether in one session or as the "after" stat) and hit the Print-Screen-SysRq key. 4. 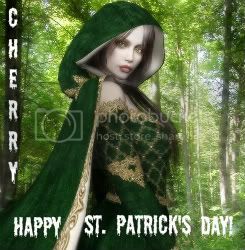 Bring up your graphics program and paste (right-click or ctrl-v) the image onto the blank page. Voila! There is the game you’ve been playing! 5. Let’s clean it up a little bit. Use the cropping tool to get rid of any unnecessary flotsam. 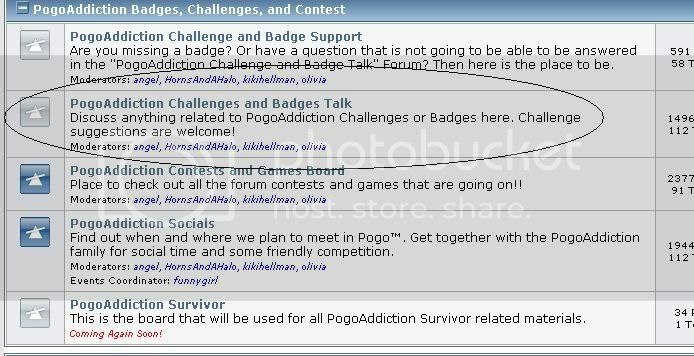 If this is an image you’re going to post in the forum, use the eraser to remove any personal information and all pogo players names from the chat box area (if you’ve included it). If it is solely for the PA challenge, you needn’t worry about that as the only person who sees it is LittleOne. 6. Now choose File> Save as and give it a name. Take note of the “Save as type” field! Make sure you choose JPEG or .jpg; bitmaps (.bmp) are huge data hogs and won’t work well on many image hosts or in forum fields. 7. Complete the challenge with any additional required screenshots just as you did with this one. ***If you have a question about the challenges--what screenshot to take, etc—do NOT use the Request/Submission form to ask! Once you’ve submitted your challenges, they’re submitted. It’s better to ask for clarification before hand, or to browse some of the other tutorials and FAQ pages. Someone will have the answers to your questions! Common sense is the key--any screenshot will do as long as it clearly shows the challenge criteria. There you go! That should get you started on our great PogoAddiction Badge Challenges! Once you start, you won’t want to stop! Don’t miss the Timeless Badges section; you can do these at any time! And for the truly dedicated check out the PogoAddiction Premium Badge Albums and Mix-and-Match Badges available for purchase in our Shop. We always have Friday PA Socials to help each other out with PogoAddiction Challenges, either as a helpful partner in Spades or just for some moral support, so check out the Socials Board and Calendars and join us there! Feel free to PM and Staff Member if you have any additional PA Weekly Challenge questions! Please note that all of the blue-lettered phrases and sentences in this post are hyperlinks that will take you directly to that information with just a click! Happy Badge Hunting! im pleased with my addiction!! Re: Tutorial: PogoAddiction Badges 101 - Where to start and what to do! is there a specific question in order to give us an idea of just what aspect you need help with? Everyone wins bingo is a nice one to do to get you started. Correctly place 100 daubs (takes 2-3 games of 5 card to complete; check your current game stats in your profile/when it says you have 100 or higher daubs placed take a screen shot of your profile , once you have your stats loaded into a image site follow the step by step instructions at the top of the thread). Once you submit your badge request it can take a few days for the badge to show up in your profile. New weekly badges are listed sometime every friday. hi I posted some badges, acorn amid the leave (everyone wins bingo) and It's all about the 3' (canasta) and aslo one for dice city roller too. how do i find the badges I have won? by clicking on your profile, and then on the left in the profile info box, you will see 'PogoAddiction Badges'. Keep in mind that LittleOne needs to approve all badge submissions, create and album then add your badges once approved. It isn't an instant process. and debby, bear in mind that ONLY the TWO weekly badge challenges are free ones; this week it's Monopoly Slots and Blackjack Carnival. one of those you cited is a PA Mix-and-Match badge--you'll need to purchase and redeem a Mix-and-Match ticket from the PA Shop in order to qualify for it. the acorn badge was an old one from last august--the only way you can play for that one right now is by redeeming a PA Personal Challenge Ticket first. one little approves your badge requests, you'll find them in your album by going to your profile and clicking on "PogoAddiction Badges" right above the Request a Badge link. I just completed the requirements for this week's Magic Armadillo Badge in Texas Hold'em Poker but when I go to "Request a Badge" that challenge no longer appears although it was there yesterday. I'm confused as to why this has happened. Is there a limit to how many peeps can ask for a badge? Or, can only one weekly challenge per week be requested? did you submit that challenge (or any other challenge) yesterday? usually it only disappears as an option when you've already requested it (although it may not show up immediately in your album; littleone needs to check those first). there's no limit to how many can request the badge, and you can do both weekly challenges as your time and desire allows. I did submit the Royal Porker Badge in Hog Heaven Slots yesterday, but I don't believe that I requested the Magic Armadillo Badge in Texas Hold'em Poker yesterday. is it possible that you inadvertently selected the wrong game yesterday? is the hog heaven challenge still available? OK so I am not 100% sure that I understand exactly what I have to do....but I am going to try it. And hopefully it works! Wish me Luck!! meck, this tutorial is about as simple as it can be. Just follow the steps one at a time and before you know it you will be on your way to your badge submissions for PA. Perhaps open more than one browser window so you can refer back to the tutorial as you complete the steps? Page created in 0.505 seconds with 49 queries.